They say that birds of a feather flock together, but if there are no creatures who share your call or plumage, it can be difficult to find your place in the nest — even if you represent a significant portion of the overall tree. That is why the American Public Works Association is encouraging its chapters all across the nation to incorporate more diversity into their workplaces in order to more accurately depict the communities they serve. According to the APWA’s Diversity Resource Guide (2013), “Diversity is neither an affirmative action nor an equal opportunity program.” Rather it is the conscious recognition of the various ways in which people differ from one another. The APWA believes that having a diverse workforce is not only the right thing to do, but also a matter of survival, prosperity and productivity. By creating a more diverse staff and an enriched environment where all opinions and insights are encouraged and valued, they can have a better understanding of the wants and needs of their customer base. Put simply, diversity is good for business. The city of Saint Paul, Minn., has approximately 3,000 employees across 600 job titles and 13 departments, and when former Mayor Chris Coleman examined the demographics of his constituency with the demographics of his city employees, he noticed something was severely out of alignment. 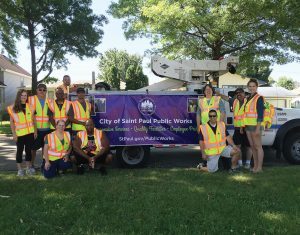 Approximately 40 percent of Saint Paul residents were people of color, but they only represented 19.5 percent of the city’s workforce. In order to make sure that his community would continue to thrive and grow, he announced a concerted effort to diversify the various departments, and it is a decision that the city continues to take very seriously. 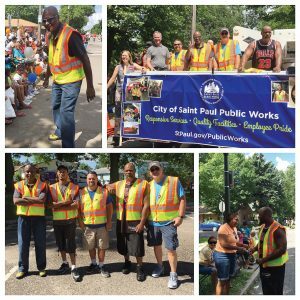 Ellen Bials, administrative programs manager for the Saint Paul Public Works Department, said the mayor’s edict caused her department to examine how it was recruiting, hiring and retaining qualified workers while also making sure diverse candidates were encouraged to apply. That isn’t always easy. According to Beverly Farraher, operations manager and engineer for the city of Saint Paul, one of the barriers to talent acquisition is the lack of visible role models in organizational positions. When well-qualified people do not see anyone on staff who looks like them, it can prevent them from applying for the job. Once a department overcomes the barriers to procuring a varied talent pool, the outcome is worth it. Farraher said a diverse workforce is a benefit to any organization because it can introduce a wide range of skill sets to the department and improves the way employees may tackle a project. A diverse workforce also enables a department to evolve and change the way it does things based on demographic changes in the community. When Saint Paul struggled to plow some of its streets because residents were not moving their cars, the diversity in its department helped them realize there were a number of reasons for the lack of compliance. Many of the residents are renters who do not remain in the area long term and are unaware of the rules from one year to the next. Others do not speak English, cannot read supplied literature and are hesitant to answer the door to officials trying to help alert them of the rules. Bials said recognizing and fostering diversity in a community is a challenge and will always be a work in progress because the population evolves over time. Farraher agreed that everything evolves, but when a department is intentional about diversity and is committed to training others to welcome differing opinions and ideas into their workplace, it creates a polite, respectful and dynamic organization that is committed to the community it serves. “I personally believe that we are making headway … but it is work that will never end,” she said.